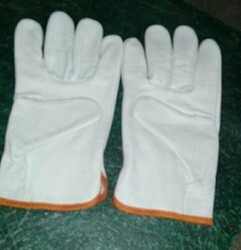 Our Industrial Gloves for factory workers. 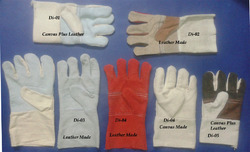 We are custom manufacturer of Industrial Gloves as Denim, Canvas, Leather Gloves. We provide Leather Gloves for industrial and construction applications. Leather gloves have great abrasion resistance, which makes them an ideal choice for heavy-duty jobs. The Leather Gloves offered by us fit to the demand of clients and provide exceptional comfort level. - Premium leather welding gloves. Full leather back till the cuff. Protection against rough objects, heat, sparks and flames. •Available in different sizes as per clients requirements. To meet diverse requirements of our clients in the best possible manner, we are offering a comprehensive Hand Gloves at very reasonable price.